Volunteers are harvesting rainwater to grow a garden and protect the bay. 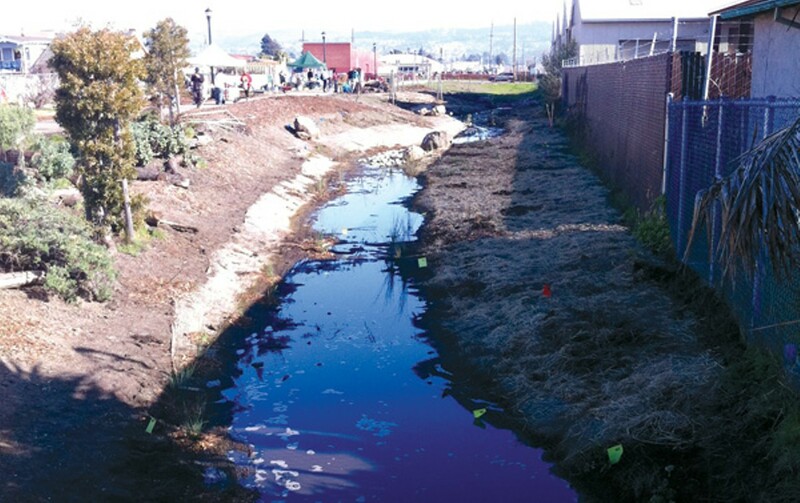 Activists hope that, in time, the bioswale will look like any other hillside creek. In a drought-plagued state, why waste the rainwater? It's a point Matt Freiberg makes often. "When it rains, you see a tremendous amount of water flowing through the streets," said Freiberg, who works for the Watershed Project, a Richmond-based nonprofit. "We're stuck in this 1950s mentality of man versus nature ... where storm water is a nuisance, not a resource." Even in the environmentally progressive East Bay, capturing storm-water runoff and reusing it is unusual. Typically, storm water, accompanied by the contaminants and trash that flow with it, rushes into San Francisco Bay, adding to the overall pollution. Freiberg, however, is leading a local effort to capture storm water and use it to grow a garden. Yet in cities with wall-to-wall concrete, that's not as easy as it sounds. "We've paved over everything," noted Linda Hunter, executive director of the Watershed Project. "Water used to go into the ground when it rained, but now, because we have all these impervious surfaces, it has to be directed to the gutter." The gutter directs that water, eventually, to the bay. So Freiberg teamed up with a group of local volunteers to build a bioswale, a manufactured creek that snakes alongside the Richmond Greenway for one city block. The greenway, a stretch of former train tracks-turned-bike path, intersects the Ohlone Greenway in El Cerrito. Freiberg hopes, in time, that the bioswale will look like any other hillside creek that is shrouded by flourishing vegetation. As it is now, in its infancy, the bioswale might seem a little out of place beside a razor-wire fence in a neighborhood known more for its industrial pollution and crime rate than its environmental activism. But the bioswale is purposefully positioned to capture the rainwater that flows through the city streets one block away. After a storm, the water flows through a culvert and enters the bioswale, where it meanders until it's absorbed into the soil. The soil and compost were chosen carefully. The bacteria they possess breaks down organic pollutants like motor oil, gasoline, and dog feces. In addition, the native plants were chosen for their deep roots — roots that can effectively break up the soil to allow for greater absorption. It took a village to design and construct the bioswale. Two companies, Restoration Design Group in Berkeley and Questa Engineering Corporation in Richmond, donated their services. Local corporations offered discounts and contributed supplies. Volunteers helped build it. Freiberg said it's a natural, low-impact alternative to a costly storm-water treatment facility, which, of course, neither Richmond nor any other East Bay city has. The bioswale at once beautifies the neighborhood and catches and treats contaminated water. Scientists once believed that agricultural pollution was the largest source of contamination in the bay. But a recent study by the San Francisco Estuary Institute found that urbanites are actually to blame nowadays. Most of the pollution in the bay comes from our neighborhoods. Common storm-water contaminants include motor oil and grease from cars, pesticides from gardens, pet waste, and household chemicals. Richmond has contributed plenty of pollution as well, thanks in part to outdated sewage treatment systems. In 2006, Baykeeper sued the city for releasing hundreds of thousands of gallons of raw sewage into the bay, via storm drains and the Santa Fe Channel. That kind of pollution has obvious downsides. It poisons wildlife, soils beaches, and clogs sewer lines. Storm water also could lead to large-scale environmental damage. Researchers at UC Berkeley recently found that a common pesticide "chemically castrates" about 75 percent of male frogs, preventing them from reproducing. The pesticide also turns one in ten male frogs into females. Pesticides leaking into water supplies could account for the worldwide decline of frogs. So, is the Richmond bioswale working? Freiberg pointed out little surface pools of oil slicks dotting the area where water first enters. As he moved down the creek, there were fewer slicks. "Other bioswales get a significant reduction in pollutants as the water goes through," he said. "Makes me think this one is already successful in reducing contaminants." Freiberg acknowledged that one bioswale may not make much of an impact in reducing overall pollution, but he hopes to inspire a kind of bioswale network. He said Richmond's is meant to show cities and developers low-impact options for treating rainwater runoff. All you need is a plan and some donated labor. On a recent visit, volunteers were swarming the site to collect garbage and plant native grasses. One volunteer cautioned children not to eat with their hands immediately after digging. The site is notorious for legacy ground pollution, in part because of the rail tracks that once traversed it. The brand-new creek also has endured some setbacks. In the beginning, newly planted trees were uprooted and stolen. But now, dozens of plants line the creek. Hunter said she hopes to stimulate community involvement so that locals feel ownership of the site and continue to protect it. Can social media help save a forest?